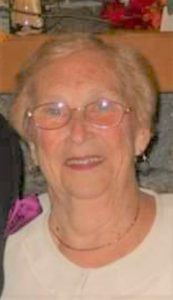 Family & friends are invited to attend Visiting Hours on Wednesday, February 6th from 4:00 p.m. to 8:00 p.m. in the Vertuccio & Smith, Home for Funerals, 773 Broadway, Revere for Helen M. (Shaughnessy) Shea, who passed away on February 1st, following a lengthy illness at 87 years. Her funeral will be conducted from the funeral home on Thursday, February 7th at 9:30 a.m., followed by a Funeral Mass in the Immaculate Conception Church (Corner of Beach St. & Winthrop Ave.) REVERE at 10:30 a.m., and immediately followed by interment in Holy Cross Cemetery, Malden. Born and educated in Revere, she was an alumna of Immaculate Conception High School, Class of 1949. Her ties with the Immaculate Conception Church Parish community were true and tried for many years, when she was a member of the Ladies’ Sodality and the Maria Assunta Guild. She was an athlete of some standing, especially enjoying swimming. In later years, Helen was a member of several of the North Shore Candlepin Bowling Leagues. Helen enjoyed spending time with her family especially during annual family cook outs. She was the beloved wife of the late Donald R. Shea, Sr. Devoted mother of Patricia A. Leonard & her late husband Stephen R. of Lynn, Robert G. Shea & his wife Eileen of Gloucester, VA, Kevin M. Shea & his companion Tracy DeBay of Revere, Donald R. Shea, Jr. & his companion Christine Chadwick of West Bridgewater & Timothy P. Shea & his wife Jodi of Orlando, FL. Proud grandmother of Christopher S. Leonard & his wife Karen of Peabody, Michael Leonard & his companion Mindy of Marblehead, Kelly Shea & her husband Matthew O’Connell of Swampscott, Alanna Martin & her husband Seth of Ellicott City, MD, Kevin M. Shea of Nashua, NH, Meaghan Shea, R.N. of Boston, Adam Shea of Nashville, TN, Kyle E. Shea & his companion Shawna of Hudson, NH, Andrew Shea of Tallahassee, FL, Sara M. Shea & her companion Timothy Bent of Nashua, NH, Julia & Matthew Shea, both of Saugus & Patrick Shea of VA. Cherished great-grandmother to Aden, Avery, Norah, Seamus, Quinn & Maeve. Also lovingly survived by Claire Shea of Nashua, NH, & her faithful canine buddy, “Misty”. Dear sister of the late Mary Clifford, Joseph, Paul, Thomas & Gerald Shaughnessy. Many nieces & nephews also survive Helen. Wednesday, February 6th from 4:00 p.m. to 8:00 p.m. In lieu of flowers, remembrances may be made to the Alzheimer’s Association, 309 Waverly Oaks Road, Waltham, MA 02452. Thinking of you with prayers and love at this time of heartache. Deepest Sympathy and Prayers to your family during this time.